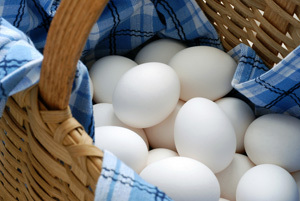 Egg allergy is one of the most common allergies in children, second only to cow’s milk. The good news is that most children outgrow the allergy by age five. Skin test – A skin prick test is used to expose small amounts of the protein to your body. A food allergy is confirmed by the presence of a raised bump or hive at the prick location. Blood test – A blood test, also referred to as an IgE test, measures your immune system’s response to the proteins found in eggs by counting the number of specific antibodies in your blood. Food challenge –Following ingestion of gradually increased amounts of the suspected food allergen, you undergo careful supervision for a few hours or days to determine if any allergy symptoms occur. This test may also be performed to confirm that a child has outgrown his/her egg allergy. Eating Out: When dining out, ask detailed questions about ingredients and how the food was prepared – your health and safety are at stake! There’s a high risk for cross-contamination in the kitchen so be sure to clearly express your food allergy to the server or cook. Ask to look at the food package if necessary. On the menu, look out for common egg-containing foods (listed above). A new diagnosis can be scary. Be sure to build a support system of family, friends and healthcare professionals to help you manage your egg allergy. Talk to a doctor or registered dietitian when eliminating foods from your diet about possible vitamin and mineral deficiencies. They may recommend an adjustment in your meal plan or a supplement to replace nutrients lost by eliminating the offending food and food ingredients. Also talk to your doctor about how to prepare for a reaction. You may treat a mild reaction with oral antihistamines to reduce signs and symptoms and relieve discomfort. If you are at risk for severe reactions or anaphylaxis, your doctor may advise you to wear a medical alert bracelet and/or prescribe an injectable epinephrine (EpiPen) to carry with you at all times.